Nutritional Therapy Practitioner, Certified Personal Trainer, and Real Food Foodie Shawn Mynar and eating disorder overcomer and Registered Holistic Nutritionist Meg Doll join our hosts Jimmy Moore and Jenna The Paleo PA today in Episode 177 of "Low-Carb Conversations With Jimmy Moore, Jenna The Paleo PA & Friends!" Welcome here to another awesome Friday look at some of the headlines making news in the world of health. Our new cohost Jenna Lightfoot (aka Jenna The Paleo PA) has been stellar alongside veteran health podcast Jimmy Moore sharing educated opinions on diet, research, and healthy living. Do you like what you hear on this weekly podcast? If you would like to help us keep this listener-supported podcast on the air, then CLICK HERE to make a donation of any amount to help us towards that goal. THANK YOU FOR YOUR SUPPORT! Jimmy and Jenna banter at the beginning about the new Friday low-carb support group in Jenna's medical office, Jimmy attending Dr. Jeffry Gerber's Low Carb Vail conference in Vail, Colorado next weekend (and why we won't have an episode next Friday), how Jimmy's Blue Yeti microphone zapped out on him in the middle of the recording two weeks ago, and Jimmy's breakneck schedule right now. 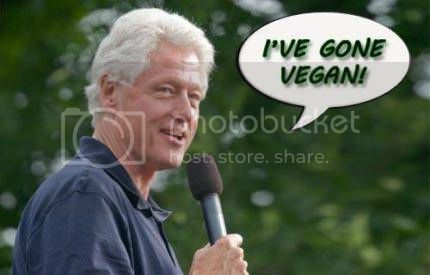 IS BILL CLINTON A VEGAN AGAIN? - Rig Your Studies Much? - Is too much insulin in your body responsible for obesity? - Neither of these ketchups contains gluten. So why are we charged 50% more for the one labelled gluten-free? at the end of the show. Now you know what to do--pull up a chair, grab a cup of coffee, and let's talk!